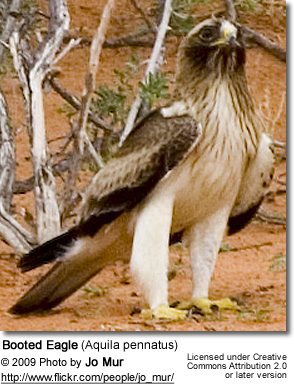 The Booted Eagle (Aquila pennata) (formerly Hieraaetus pennatus) belongs to the family Accipitridae. 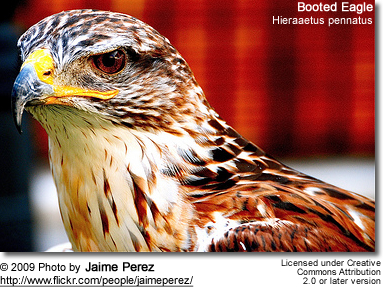 Recent genetic research resulted in the reclassification of this species to the genus Aquila from Hieraaetus. 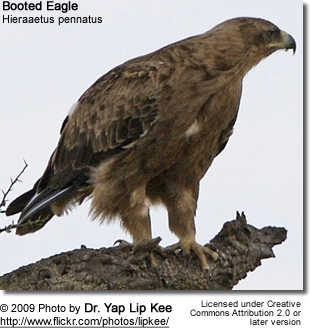 As it is the type species of Hieraaetus, should any of the hawk-eagles be retained in a distinct genus a new name for that group would be necessary. Along with the Little Eagle this bird is one of the closest living relatives of the extinct Haast's Eagle of New Zealand. 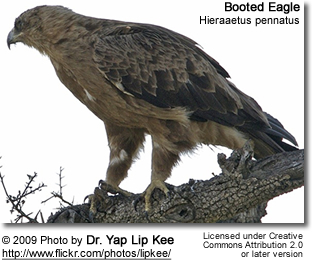 This is a medium-sized bird of prey, but the Booted is a small eagle, comparable to the Common Buzzard in size though more eagle-like in shape. Males grow to about 700 grams (1.5 lbs) in weight, with females close to 1 kilogram (over 2 lb).It is about 47 centimeters (18 inches) in length and has a wingspan of 120 cm (almost 4 feet). There are two relatively distinct plumage forms. Pale birds are mainly light grey with a darker head and flight feathers. 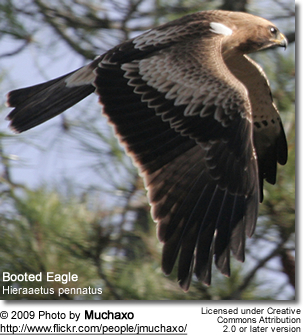 The other form has mid-brown plumage with dark grey flight feathers. It breeds in southern Europe, North Africa and across Asia. It is migratory, wintering in Sub-Saharan Africa and South Asia. This is a species of wooded, often hilly countryside with some open areas. It hunts small mammals, reptiles and birds. This eagle lays 1-2 eggs in a tree or crag nest. The call is a shrill kli-kli-kli.